I never used to eat breakfast. I was just never hungry first thing in the morning. I used to leap out of bed and head straight to school. My morning routine took ten minutes, and I would eek out every minute of time I could spend under the duvet. I should point out that I did wash. But I never looked particularly... polished. I still don't, come to think of it. Even now, I’m not a big breakfast fan. Special K with Red Berries, and I’m done. Nothing fancy. When I’m away, it all changes. Suddenly, I want a plate piled high with pancakes, bacon and syrup. I want a selection of pastries, I want juice and I want coffee. I want it all! If I'm away in the sun, a good breakfast can usually hold me until dinner, so long as an ice cream is thrown into the mix somewhere in the day. Which is why a good hotel breakfast can make a huge difference to a holiday. So here is a selection of my latest breakfast victories (and failures). On my first morning, I came down to the foyer to see what the story was with breakfast. I followed someone from my group to the bar, where we saw a tiny menu which pretty much offered toast or croissants. My heart sank. But then all was saved, when another girl pointed me to the actual breakfast buffet. Ahhh. A breakfast buffet. It didn’t disappoint. A plethora of pastries, a Nespresso machine (which always reassuringly makes me think of George Clooney) and endless platters of fruit. There was a hot buffet I didn’t even touch, a platter of meats and a tank of freshly squeezed orange juice. I ate… melon, prosciutto, a Clooney coffee, and a Krispy Kreme style donut that haunts my dreams to this very day. Vanity dictated that I only had one, but if I'm ever in that situation again, I'll have four. Considering it costs an extra €29, it wasn’t the breakfast of dreams I was expecting. There were plenty of mini pastries, a vast selection of cereals and fruits, and lots of hot stuff. The coffee wasn't great, and there wasn't any selection of hot drinks. A waitress came to the table with either tea or coffee. This is starting to sound a little 'first world problem', right? But when you've been drinking George Clooney, you get accustomed to a certain way of life. I ate... crepes, American style bacon, maple syrup. Don't get me wrong, it was a nice breakfast, but it wasn't worth €29. Go and find a patisserie instead. Typically, hostel breakfasts are rank. Rubbery bread, butter that ISN'T BLOODY BUTTER, and stale cereal is usually the order of the day. But Green Tortoise show that a hostel can do it even better than a fancy pants hotel. They know what you need, and keep it simple. In the morning, there's a huge tray of different bagels, which you slice in a very exciting bagel slicer and put through an even more exiting toaster oven. Then there's a big variety of spreads: butter, jams, peanut butter, cream cheese etc. A selection of juices, teas, coffee is next to a platter of fresh fruit, cut into chunks. Simple, free and exactly what you need to set you up for the day. Well played. I ate... a sesame bagel with cream cheese, pineapple, mango and banana, and juice. Is anyone else really craving breakfast now? You should try breakfast in the Hayfield Manor in Cork - any type of cooked breakfast you like, made to order and served to you and then a buffet with smoked salmon, cream cheese, pastries, bread, fruit salads etc! pricy but worth it - just don't eat for a week before! Sounds gorgeous! 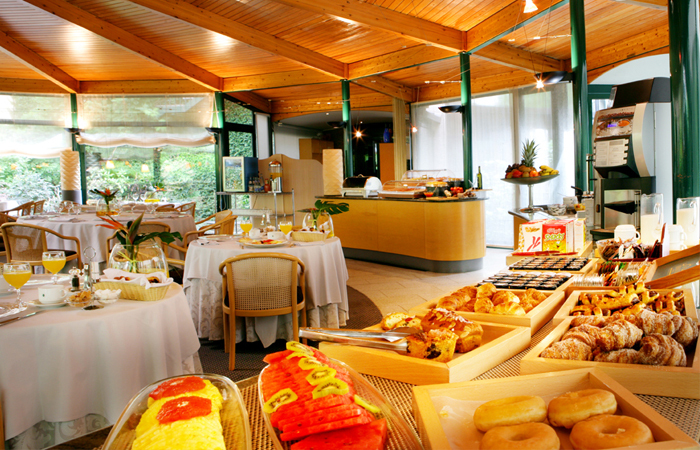 Breakfasts can make or break a hotel, can't they?